Detectives investigating a shooting on a Halifax street have released an E-fit of a man they would like to speak to. Officers were called to an address in Parkinson Lane shortly before 11pm on Tuesday, February 23. following a report that shots had been fired earlier, causing damage to a window. A silver vehicle was seen driving away from the scene. Police are keen to speak to the man in the E-fit who is believed to have been in a silver Vauxhall Astra, registration MJ51 HCN. Police are linking this vehicle to the incident. 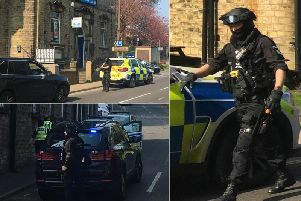 Detective Chief Inspector Mark Swift, who is leading the investigation, said; “We would like to speak to this man in connection with the vehicle that we believe was used on the night of the firearms discharge. Anyone with information should contact DC Alex Grummit at Homicide and Major Enquiry Team via 101. Information can also be passed to Crimestoppers on 0800 555 111, or via their anonymous online reporting form at crimestoppers-uk.org.